People go to the beach to unwind, swim and have enjoyment on the side, but hardly expect a plane dropping from the sky. But it happened on Sunday when a plane dropped at Caspersen beach in Sarasota, Florida, United States, killed a 36 year old father, Ommy Irizarry, mortally injured his daughter, Oceana Irizarry and others. 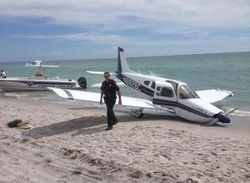 Father and daughter were reported walking on the beach, unaware a plane above in the air had developed a mechanical problem and sought a place for emergency landing. The pilot is reported to have radioed about his inability to get the plane to the airport. People heard of death by drowning in the beach and occasional death caused by dropping in the sand, certainly not a plane dropping from the air. For a father, his daughter and others in the beach who had left their homes unaware of what fate awaited them explained the mystery about human lives. Yet, the pilot, Karl Kokomoor and his lone passenger, David Theen, both of Englewoood, survived the crash.